Plaid is everywhere this fall! Usually I don’t buy patterned leggings. That’s not really true, I buy them, but then I don’t wear them, so I try not to buy them. But I had to have these, and I thought I would just wear them with a long top. 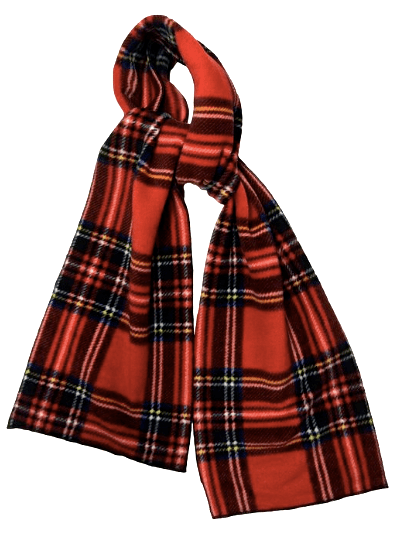 After I saw the photo below, I decided I needed another tartan to bring the look together and I bought a scarf, which makes me much happier. This top is sort of a summer top from Torrid. I bought it on sale the last time I was in Palm Springs, and I will imagine I will get a lot of wear out of it this summer. When the fleece scarf arrived from Amazon it was much brighter than the leggings (and brighter than this photo), so I decided to dye it. I brewed 8 Lipton Tea bags in 4 cups of water and then let it steep for 10 minutes, and then put the scarf in the very dark tea to darken the entire scarf. I am quite happy with the result. The scarf is still a little brighter than the leggings, but not as much as it was. This is an inexpensive way to create a new look with clothes you already have. A pair of tights and a scarf, worn with a simple black dress, jacket and boots creates the illusion of a new look in your wardrobe, because the eye is drawn to the tartan. I cannot even tell you how much I like my new boots. I have resisted buying an ankle boot because I am convinced I have some in a box someplace, but these came on sale, and I just had to have them. They are very lightweight, which is good for my knees, but probably would not hold up well in a serious winter climate. They have a zipper on the inside, which I seem to need even with an ankle boot. I tried a pair with just an elastic gore and I could not get them on my foot. 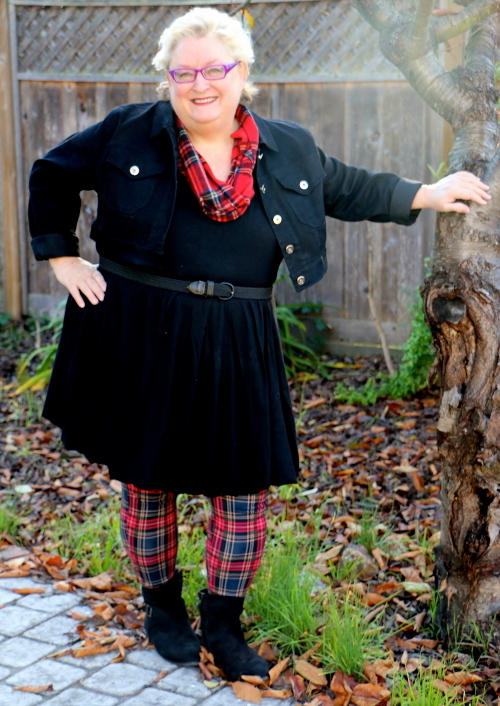 This entry was posted in ASOS Curve, Avenue, Torrid, Wide Boots and tagged Dying a Scarf, Plus Size Tartan Leggings, Wide Ankle Boots by affatshionista. Bookmark the permalink. Absolutely gorgeous! Now I want some tartan leggings! Dyeing the scarf in tea is a fab idea and I love those boots! Those leggings are great! Love your blog, you are a beautiful sassy lady and I love your style! I was just wandering by while looking for plus-size fashion bloggers in skinny jeans for a friend who is hesitant to try them (I think she should!!). I just wanted to let you know that your style is SO! AWESOME! and I especially love this outfit!! I am a sucker for plaid and you totally rock those leggings, they are styled so perfectly with the boots and scarf. And the little cropped jacket! Love it!! Thanks for the kind comment. I think that the triangle of wider on top narrowing to the ankles can be very becoming. Plaid looks like it is going to be very big again this year so I am sure I will be wearing this a lot. Love the plaid, and love that you dyed the scarf. I tie-dye occasionally, but I haven’t ever tried to alter the color of something…. I used to have some slouchy knee boots that didn’t need a zipper, but those are about the only kind that worked without one. Those kind with elastic sides don’t stretch enough if your feet have higher arches. Thanks for your comment. I don’t seem to have high arches so not a problem.